The official QCMC 2018 accommodations will be the Lod Cook hotel and the Staybridge hotel. A group discount code is provided for these locations. Please note that the deadline to book a room at these locations with the group discount is Feb 20. A map of the area is given here to assist you. 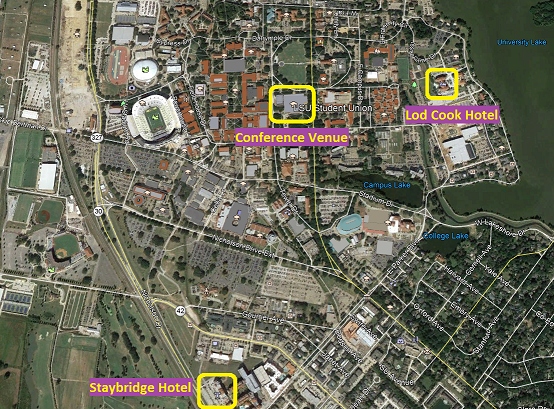 The Lod Cook hotel is located on LSU campus, about 18 minute walk to and from the Student Union where QCMC18 is hosted. Please note: you must call Staybridge at the provided number and request for the QCMC group rate -- the discount will not work when booking online. The Staybridge hotel is located just outside of LSU campus, about 22 minute walk to and from the Student Union where QCMC18 is hosted. View our QCMC 2018 key points map for additional lodging accommodations. Please see our Travel Tips page for information on reaching LSU and navigating Baton Rouge.